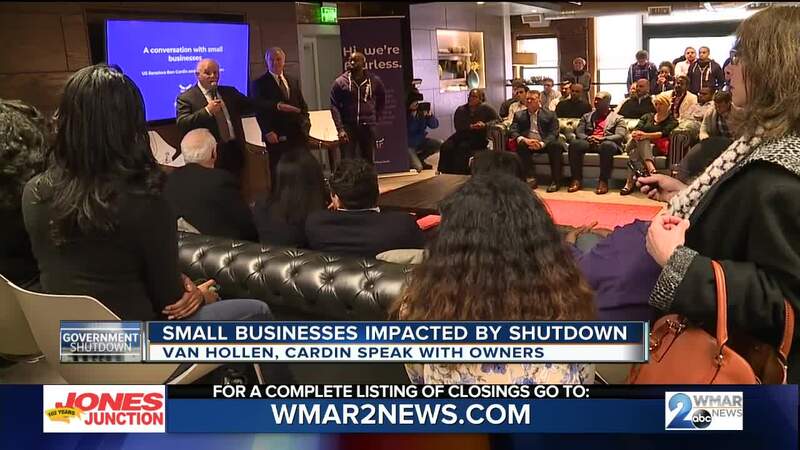 Maryland Senators Chris Van Hollen and Ben Cardin met with small business owners Thursday that are feeling the impact of the government shutdown. BALTIMORE (WMAR) — While we have heard about the thousands of federal workers force to stay home or work without pay, small businesses and entrepreneurs are also feeling the effects of the partial government shutdown. Maryland Senators Chris Van Hollen and Ben Cardin met with owners Thursday at Power Plant Live! "Small business is the growth engine of jobs in Maryland and in this nation and that growth has been cut off," Sen. Cardin said. Besides losing money from federal workers that would support their business, some small business owners depend on loans and government aide from the the Small Business Administration. Because of the shutdown, they are not able to get those loans meaning some businesses may have to lay off workers or close. "We've also hearing more and more from small businesses here in Maryland and across the country that depend on the loans they receive from the Small Business Administration that they're just not able to keep their operations going," said Sen. Van Hollen. Both Sen. Van Hollen and Sen. Cardin introduced a bill earlier this week to secure back pay for federal workers and contractors who are not getting paid during the shutdown. The bill was signed Wednesday by the president.